Steve Morison and Liam Trotter scored first-half goals as Millwall cruised to a Carling Cup second-round victory. Millwall opened the scoring when Matthew Kilgallon brought down Alan Dunne in the penalty area and Morison converted the resultant spot-kick. Trotter made it 2-0 when he finished from Neil Harris's header across goal. Julio Arca's 25-yard strike hit the bar as Boro fought back before David Forde misjudged Scott McDonald's shot to gift the visitors a consolation goal. But overall, Millwall boss Kenny Jackett's side barely got out of second gear as they brushed Boro aside. Former Stevenage striker Morison impressed throughout, and the Lions were worthy winners. The only blot on the the home side's copybook was the error from Forde, who seemed to think the ball was going over from McDonald's strike and he bizarrely let the ball go into his net. But it did not prove costly for the keeper as his side advanced to third round. However, Middlesbrough boss Gordon Strachan was unhappy with the penalty decision. He told BBC Tees: "In life as, I said to the referee, I get paid more than the coaches, and the referee more than the linesman, because I have to make the big decisions. "If I have to release a player, then I have to look him in the eye and make that decision, I don't send my backroom staff to tell them they're freed. "So if you're five yards away and there's a decision to be made, you decide no penalty, there's no point in looking at someone 15 yards away to say 'is that a penalty?'" 92:51 The referee starts the match. 92:51 The final whistle is blown by the referee. 89:42 Darren Ward challenges Kris Boyd unfairly and gives away a free kick. Nicky Bailey takes the direct free kick. 88:17 GOAL - Scott McDonald:Millwall 2 - 1 Middlesbrough Scott McDonald fires in a goal from just outside the penalty area high into the middle of the goal. Millwall 2-1 Middlesbrough. 87:21 Corner taken by Darren Carter, save made by Jason Steele. 86:38 Kris Boyd has an effort at goal from the edge of the area that misses to the right of the target. 86:22 Attacking throw-in by Justin Hoyte (Middlesbrough). 85:39 Corner taken by James Henry, Steve Morison has a header from close in and clears the crossbar. 85:18 Shot by Steve Morison. Jason Steele makes a save. 84:57 Attacking throw-in by Alan Dunne (Millwall). 84:40 Attacking throw-in by Barry Robson (Middlesbrough). 84:11 Goal kick taken long by Jason Steele (Middlesbrough). 83:05 Attacking throw-in by Justin Hoyte (Middlesbrough). 82:11 Scott McDonald has an effort at goal from the edge of the box that misses to the right of the target. 81:10 Defending throw-in by Scott Barron (Millwall). 80:47 Defending throw-in by Alan Dunne (Millwall). 78:55 The assistant referee flags for offside against Scott McDonald. Free kick taken by David Forde. 78:05 Outswinging corner taken from the right by-line by James Henry, clearance made by David Wheater. 77:32 Shot on goal by Kris Boyd from inside the box goes harmlessly over the target. 75:56 Free kick awarded for an unfair challenge on Kris Boyd by Paul Robinson. Nicky Bailey takes the direct free kick. 75:03 Substitution Darren Carter replaces Danny Schofield. 75:03 Substitution Neil Harris leaves the field to be replaced by Kevin Lisbie. 73:30 Inswinging corner taken by Barry Robson from the right by-line. 70:40 Barry Robson is penalised for handball and concedes a free kick. Free kick taken by James Henry. 70:11 Goal kick taken long by David Forde (Millwall). 69:47 Booking Tarmo Kink goes into the book. 69:42 Booking James Henry goes into the referee's book. 68:43 Attacking throw-in by Barry Robson (Middlesbrough). 68:03 Kris Boyd challenges Liam Trotter unfairly and gives away a free kick. David Forde restarts play with the free kick. 67:33 Attacking throw-in by Danny Schofield (Millwall).Attacking throw-in by Justin Hoyte (Middlesbrough). 67:24 Attacking throw-in by Scott Barron (Millwall). 66:50 Attacking throw-in by Alan Dunne (Millwall). 65:28 Liam Trotter challenges Andy Halliday unfairly and gives away a free kick. Julio Arca takes the free kick. 64:30 Unfair challenge on Scott Barron by Scott McDonald results in a free kick. Free kick taken by David Forde. 63:13 Substitution (Middlesbrough) makes a substitution, with Andy Halliday coming on for Matthew Kilgallon. 63:13 Substitution Leroy Lita leaves the field to be replaced by Kris Boyd. 62:53 Scott McDonald produces a right-footed shot from just outside the area that goes harmlessly over the target. Correction - 62:02 Shot from 25 yards by Julio Arca. 62:02 Effort from 25 yards by Julio Arca. 60:34 Foul by Neil Harris on Scott McDonald, free kick awarded. Scott McDonald restarts play with the free kick. 59:54 Stephen McManus fouled by Steve Morison, the ref awards a free kick. Direct free kick taken by Stephen McManus. 59:18 Shot by Barry Robson. Blocked by Liam Trotter. 58:51 Free kick awarded for an unfair challenge on Nicky Bailey by Alan Dunne. Julio Arca takes the direct free kick. 58:15 Shot by James Henry. Save made by Jason Steele. 54:16 Free kick awarded for an unfair challenge on Steve Morison by Stephen McManus. James Henry shoots direct from the free kick. 52:56 Steve Morison takes a shot. Save by Jason Steele. 52:20 Corner taken right-footed by James Henry, David Wheater manages to make a clearance. 51:55 Defending throw-in by Matthew Kilgallon (Middlesbrough). 51:32 Defending throw-in by Alan Dunne (Millwall). 50:19 Leroy Lita takes a shot. David Forde makes a comfortable save. 49:58 Free kick awarded for an unfair challenge on Barry Robson by Nadjim Abdou. Scott McDonald restarts play with the free kick. 49:32 Defending throw-in by Matthew Kilgallon (Middlesbrough). 47:53 Barry Robson fouled by Scott Barron, the ref awards a free kick. Free kick taken by Julio Arca, The ball is delivered by Barry Robson, save made by David Forde. 47:21 Foul by Steve Morison on Stephen McManus, free kick awarded. Direct free kick taken by Jason Steele. 47:00 The referee penalises Barry Robson for handball. David Forde takes the free kick. 45:00+0:56 Steve Morison fouled by Nicky Bailey, the ref awards a free kick. Direct free kick taken by James Henry. 45:00+0:25 Goal kick taken long by David Forde (Millwall). 45:00 The whistle is blown to end the first half. 42:52 Attacking throw-in by Matthew Kilgallon (Middlesbrough). 42:37 Tarmo Kink produces a drilled right-footed shot from 12 yards. Save by David Forde. 42:09 Danny Schofield gives away a free kick for an unfair challenge on Scott McDonald. Scott McDonald takes the direct free kick. 41:57 Defending throw-in by Justin Hoyte (Middlesbrough). 39:44 Scott Barron concedes a free kick for a foul on Barry Robson. Direct free kick taken by Barry Robson. 38:19 Paul Robinson provided the assist for the goal. 38:19 GOAL - Liam Trotter:Millwall 2 - 0 Middlesbrough Liam Trotter finds the back of the net with a goal from close range high into the middle of the goal. 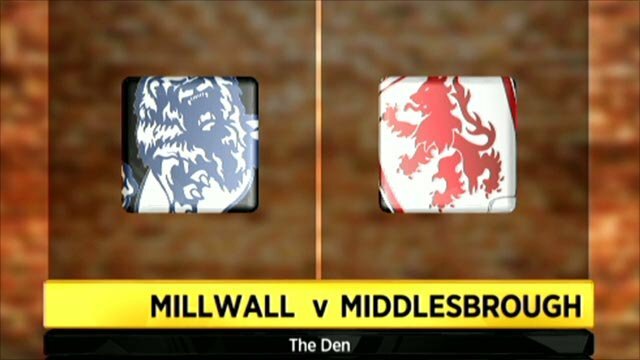 Millwall 2-0 Middlesbrough. 36:13 Neil Harris is caught offside. Jason Steele takes the indirect free kick. 35:58 Tarmo Kink has an effort at goal from 25 yards. Blocked by Darren Ward. 35:39 Matthew Kilgallon crosses the ball, save made by David Forde. 35:11 Attacking throw-in by Justin Hoyte (Middlesbrough). 34:19 Defending throw-in by Alan Dunne (Millwall). 33:59 Attacking throw-in by Justin Hoyte (Middlesbrough). 33:16 Handball decision goes against Julio Arca. David Forde restarts play with the free kick. 32:53 Steve Morison concedes a free kick for a foul on David Wheater. David Wheater takes the direct free kick. 31:31 Tarmo Kink takes a shot. Save by David Forde. Corner from the left by-line taken by Barry Robson, David Wheater produces a header from inside the area that goes over the crossbar. 30:56 Attacking throw-in by Scott Barron (Millwall). 30:19 Goal kick taken long by David Forde (Millwall). 30:04 Tarmo Kink produces a drilled left-footed shot from 35 yards and went wide right of the net. 28:54 GOAL - Steve Morison:Millwall 1 - 0 Middlesbrough Penalty taken right-footed by Steve Morison and scored. Millwall 1-0 Middlesbrough. 27:43 Tarmo Kink gives away a Penalty for an unfair challenge on Alan Dunne. 27:32 Defending throw-in by Scott Barron (Millwall). 27:07 Attacking throw-in by Justin Hoyte (Middlesbrough).Attacking throw-in by Justin Hoyte (Middlesbrough). 26:28 Liam Trotter has a headed effort at goal from deep inside the area missing to the right of the goal. 26:05 James Henry takes the outswinging corner, clearance made by Nicky Bailey. Correction - 24:33 Inswinging corner taken by Barry Robson from the right by-line, Steve Morison makes a clearance. Corner taken by Barry Robson. 24:33 Inswinging corner taken from the right by-line by Barry Robson, Steve Morison manages to make a clearance. Barry Robson takes a inswinging corner. 24:22 Shot by Scott McDonald. David Forde makes a save. 23:36 Danny Schofield is ruled offside. Jason Steele takes the free kick. 22:05 Goal kick taken long by David Forde (Millwall). 21:35 Free kick awarded for an unfair challenge on Julio Arca by Neil Harris. Julio Arca restarts play with the free kick. 21:15 Attacking throw-in by Justin Hoyte (Middlesbrough). 20:10 Unfair challenge on Stephen McManus by Steve Morison results in a free kick. Direct free kick taken by Stephen McManus. 19:35 The referee gives a free kick against Liam Trotter for handball. Direct free kick taken by Barry Robson. 18:30 Attacking throw-in by Matthew Kilgallon (Middlesbrough). 17:45 Effort from just outside the area by Alan Dunne goes over the target. 17:26 Attacking throw-in by Neil Harris (Millwall). 15:40 James Henry has an effort at goal from 12 yards. Jason Steele makes a comfortable save. 14:47 Corner taken left-footed by Barry Robson from the right by-line, save by David Forde. 12:26 Foul by Neil Harris on Julio Arca, free kick awarded. Julio Arca restarts play with the free kick. 11:18 Free kick awarded for an unfair challenge on Nicky Bailey by Steve Morison. Jason Steele takes the free kick. 6:03 Defending throw-in by Matthew Kilgallon (Middlesbrough). 5:41 Unfair challenge on Leroy Lita by Darren Ward results in a free kick. Free kick taken by Nicky Bailey. 5:18 Defending throw-in by Justin Hoyte (Middlesbrough). 4:00 Free kick awarded for an unfair challenge on Liam Trotter by Nicky Bailey. Alan Dunne takes the direct free kick. 3:24 Shot from a long way out by Tarmo Kink goes wide of the left-hand upright. 2:26 The offside flag is raised against Leroy Lita. David Forde takes the indirect free kick. 1:18 Corner taken right-footed by James Henry, clearance made by Stephen McManus. 0:38 Goal kick taken long by David Forde (Millwall). 0:20 Attacking throw-in by Justin Hoyte (Middlesbrough).